I covered the pattern last week, and it is big. I used a slightly heavier pattern paper than usual so it is somewhat unweildy. I bought 5 metres of navy and 2 metres in beige cotton lawn for a total of £14 on Chapel St market for an attempt at a wearable toile. This wasn’t enough so I bought a further 2 metres of beige at Woolcrest, also £2 per metre. If I do this in silk it is going to be expensive. Anyway the two beiges are different, but in a good way I hope. I don’t want to look too much like the gospel singers on the left. I am more trying for the look on the right – the Claire McCardell Futuristic dress. I gave it a white yoke so the dress is lighter near the face. You can see at this stage it is only pinned. You can probably see the darker top stitching on the CF of the yoke. I intend to top stitch all the seams to give stability and a slightly sporty finish, as with the McCardell dress. i have created a double layered yoke and interfaced it, and finger pressed it in order to try it on, and to pin the start of the right angled triangle to the yoke. Yes it will help me to sing Swing Low Sweet Chariot, but I will carry on. Each quarter dress is a right angle triangle, but when making the pattern I cut it into sections. Then when cutting out in cloth I kept the joining seams on the straight grain as much as possible. I enjoyed stitching nice, long straight seams, pressing them open and then just pining them onto Camilla. I liked the way the flares just folded around the curves and I really think it will look OK with a belt. At this stage I have sewed up the two fronts, and pinned them both to the yoke so you can see how the colour blocking is working as a chevron effect. Maybe it is hideous? I don’t know for sure but I think I will like it. It is a fascinating experiment in any event. I could change the yoke colour as this is a bit odd. Or maybe omit it altogether? I tested the two fronts stitched together as a yokeless dress. I think with a few modifications it might work well as a halter neck. Certainly experimenting with a circle has shown me that it possible to make a voluminous dress that drapes and flatters, and that fabric choice is everything. 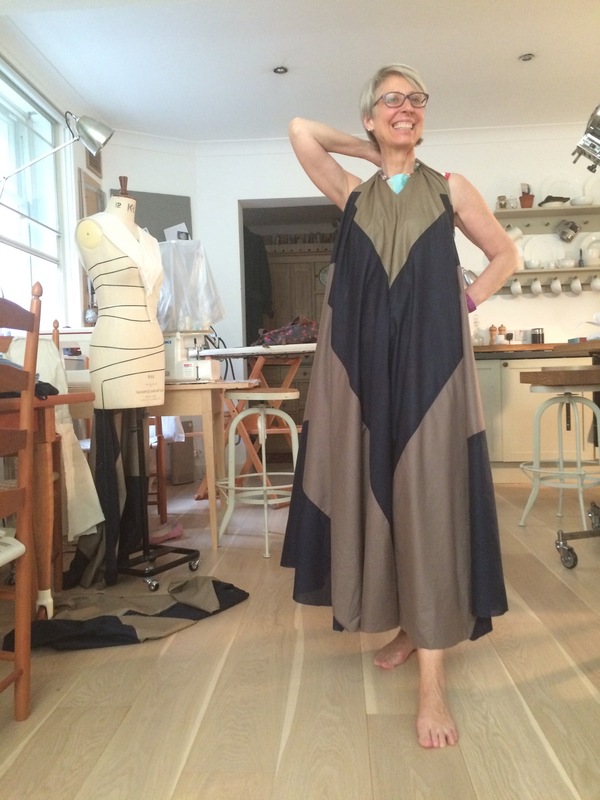 But I think I will just finish it off, try it on, and see if I should make it up in a more luxurious fabric – as Sew2Pro noted a drapey viscose might be nice (I think that is what the McCardell dress is made from). I also really like Cloning Couture Mary’s suggestion of a chiffon overdress, with a full length satin closer cut petticoat. Very soon I am going to have to commit with this one. 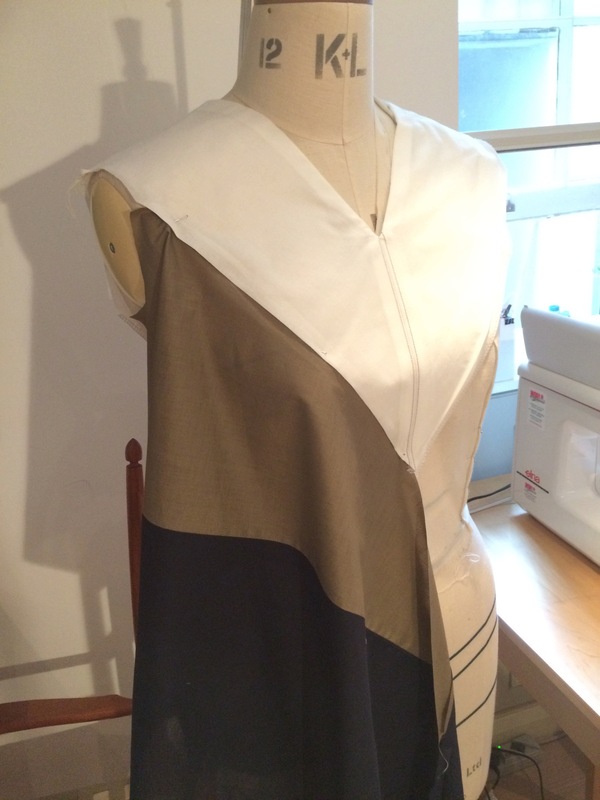 Back to the sewing machine – these long straight seams are quite fun. I will report on how I get on next week. I love it without the yoke. There is enough going on without adding a third colour. It is a lovely dress. I like the yoke, but the contrast is too strong- maybe a paler shade of beige? It’s coming on really well- a very interesting project. I’m alarmed at how much fabric it needs though- even for such a full dress that seems an outrageous yardage! The chevrons are fab. I quite like the yoke, and I love the colour blocking/chevron effect. Agree though that the yoke could be in a colour that provides less contrast, but I don’t think it’s bad. Can’t wait to see how this works out. In a swishy fabric I think this will be arresting. Love the colors and chevrons and your happy smile modeling!!! Now that it is made up in colors to see the definition, it really comes to life. I like the light yoke and it just begs for some killer jewelry when it is finished! With so much yardage I think weight might be an issue when selecting fabrics that have some heft to them, good thing you are thinking of more drapey lighter weight ones for the second version. I think it’s terrfic! Can’t wait till next week! You are a fearless experimenter. I think that the belt makes the difference between choir robe and care free McCardell. Looking good. I would keep the fabric very soft and drapey. To me the light yoke contrasts too much with your other colors which are lovely. Stylin’ it Kate, what a lovely drapey dress. I’d be tempted to add a textural fabric instead of the white? But it will be lovely no matter what. The white could be a good foil for neckwear (of the precious variety, not the air hostess variety!). I like it but agree with some others that a good yoke with less contrast would be preferable.